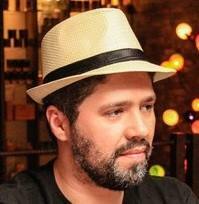 Anderson Costa is a journalist, blogger and freelance consultant who lives in São Paulo, Brazil. He is a coworking enthusiast who talks about new ways of work at @movebla and about the sharing economy at @ekonomiobr. SAO PAULO — We know that coworking is really taking off in Brazil, but until now there have been no firm numbers about the rise of coworking in this country. We didn’t even know how many coworking spaces there were. With the support of Coworking Brasil and Hub B4i, we recently completed Brazil’s first coworking census. As of 2015, Brazil’s economy is the world’s eighth largest by GDP—and the seventh largest by GDP based on PPP valuation. A member of the BRIC group, Brazil until 2010 had one of the world’s fastest growing major economies, with economic reforms giving the country new international recognition and influence. Brazil’s national development bank plays an important role for the country’s economic growth, and our entrepreneurship scene has risen in tandem. Almost 22 million people here practice some entrepreneurial activity, a number that represents 17% of the total Brazilian population. This might seem small, but our country has never seen such an entrepreneurship wave as this one. Let’s look at how coworking fits into this scenario. 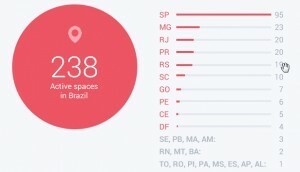 In total, Brazil has 238 active coworking spaces. Most spaces are in the southeast region: Sao Paulo has 69 spaces and is one of the economic centers of Brazil along with Rio de Janeiro and Curitiba. Together these spaces have capacity for more than 6500 workers. We believe these are the biggest coworking numbers in all of Latin America, but we can only speculate; we haven’t found similar studies on neighboring countries. Diversity in coworking is growing fast here. We see a broad differentiation in types of spaces and business models, from brands and franchises to sustainable models. Spaces like CWK in Belo Horizonte, the capitol of Minas Gerais state, support corporate teams working for multinational firms. By contrast, spaces like Laboriosa 89 in Sao Paulo function as self-managed spaces where nobody pays for use, members help maintain the space, and funds are replenished with monthly crowdfunding campaigns. Impact Hub, the worldwide coworking franchise, has five spaces here including the country’s first, Sao Paulo space. We got down into the details in an online survey we conducted with 141 spaces across Brazil. Of these, 56 spaces opened in 2014, twice the number of new spaces opened from 2013 to 2014. The most utilized source of income for coworking spaces is the shared desk in an open office, which means the concept is working. As for what coworkers do for work, social business is one of the largest growth areas that Brazilian coworkers are moving into. Twice the number of new spaces opened from 2013 to 2014. The design of coworking spaces tends to include a kind of a hybrid of private offices coexisting with open shared workspace. In the survey, 122 coworking spaces have both. Private offices tend to sell better and tend to be part of a more viable business model. Entrepreneurship, mobile working, the shared economy—all are concepts that are new for us and it’s a great challenge to incorporate these things into our mindset. For many, the coworking concept is sometimes hard to immediately understand and can be hard to convey. Some spaces strive to ensure that the ethos of coworking doesn’t get lost amidst the rise of the virtual private office. Other challenges are more tangible, like the price of real estate. The current state of coworking could lead us to some new possibilities: from collaboration between open and private space users, to a shift in whom coworking serves. To us, coworking is about collaboration, and that should be at the center of what we’re creating. These issues are not exclusive to Brazil. With so many options for remote work and collaboration, the future seems bright for freelancers and entrepreneurs in Brazil. Coworking here has told lots of good stories so far, even with small numbers compared to other countries. Shared economy models are spreading fast here and coworking spaces are a great place to watch these movements grow. Even though coworking is relatively new here, already there is a wide range of options and there seems to be a place for every type of worker in the business. This sounds decidedly like Brazil, with diversity everywhere you look. Check out the Brazilian coworking numbers, in English, at coworkingbrasil.org/censo.